What does this Life Quote teaches us? Life Quotes help you to understand the small yet crucial messages that are hidden in occurrences that often go unnoticed by us. 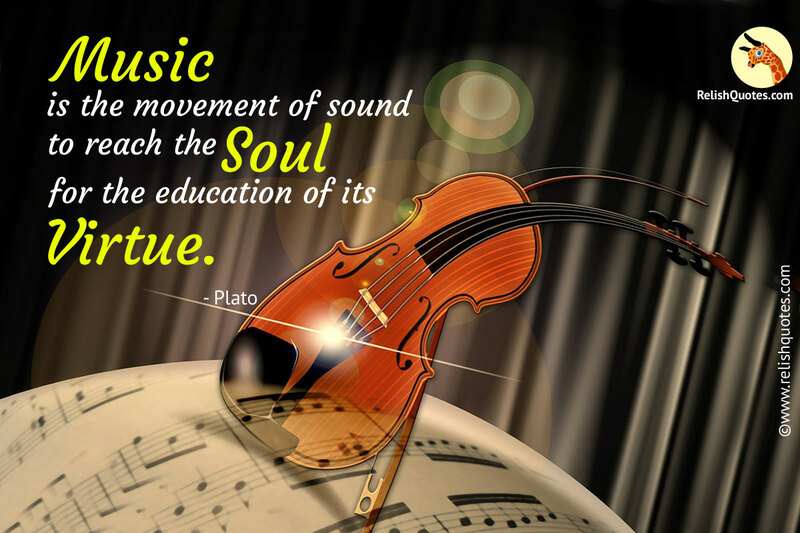 In this Life Quote by Plato, we get to learn an extremely crucial message about the most wonderful gift called Music. Music crosses all boundaries, skips and omits every kind of barrier when it comes to expression of feelings. Decorating and embellishing the unsaid words of the heart in the form of moving sound is music! Music defines the subtle yet impacting affect of the vibrations, which get created while we give a vent to the feelings of our heart through music. The human soul can be awakened, enlightened, relaxed and expressed through the medium of music. Studies and research have proven time and again that, it is music that relieves the human heart and soul of all the weariness and exhaustion caused by a fast paced life. Music provides tranquility to the heart and soul. It appeals to all the senses of humans. Positive and calming effects of music have been experienced by all of us, at some point or the other in life. But along with providing soothing effects, music fulfills one very important function too. Music helps you to absorb all the knowledge and gain expertise on the virtues that it carries along with it. Music is known to embrace a host of feelings and emotions within itself. Joy, sadness, faith, hope, despair, sacrifice, celebration of life all these are tremendously vital virtues to be learnt in life. It is this vast gamut of music that gives the beauty of sound to these emotions. When these emotions come wrapped under the cloak of music, it educates and at the same time inculcates these virtues in our mind. Music aids in effective and long-lasting learning of an endless number of desirable qualities that have a greater credibility in the long run of Life.